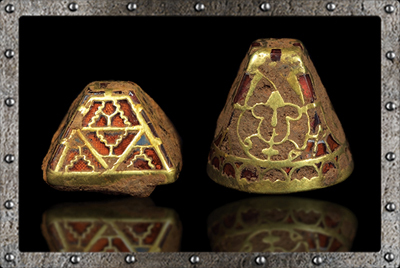 The Staffordshire Hoard is not currently available to view at Tamworth Castle. This is due to the development of an exciting new exhibition about Saxon Tamworth and the Staffordshire Hoard. An exhibition featuring 18 pieces from the Staffordshire Hoard will help visitors explore more about the power struggles of the Anglo-Saxon era, the battles, the blows and the bloodshed. Artefacts are brought to life with stunning replica weapons, hands-on activities and period costumes for young and old to try. There is no additional charge to view this exhibition - normal admission charges apply.